Car Pre-Purchase Vehicle Inspection Services. 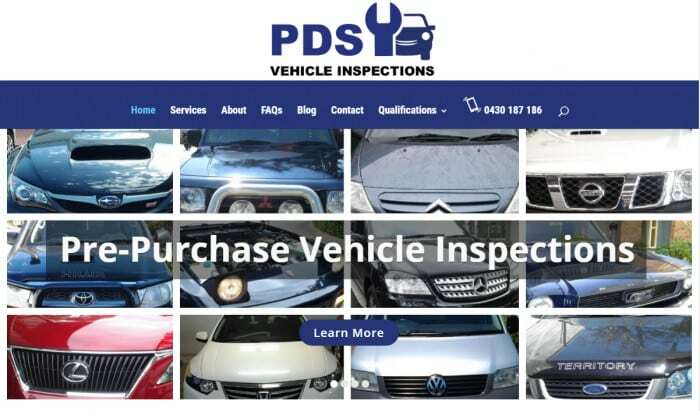 Get a PDS Vehicle Inspection before you buy your next car. Information and buying tips read our blogs on the website below. Contact us for more information, we are always happy to answer any of your questions but please remember we can’t answer phones when on lessons so if you are serious about getting quality lessons then leave a message or send an enquiry and we will get back to you between lessons. We hope you understand that when conducting driving lessons this is our students time so taking phone calls or bookings is inappropriate in our view. Penrith Driving School has male and female instructors who are very experienced in teaching the fundamentals of driving to provide the best quality and informative car driving lessons in both automatic and manual vehicles. Geoff has lived in the Penrith area for 33 years and has held an Australian MR unrestricted driving licence for 33 years. Marina has lived in the Penrith area for 29 years and has held an Australian unrestricted driving licence for 34 years. We believe in being upfront about who you or your children may potentially be undertaking driving lessons with to ensure their safety and that you know who you are dealing with and also making you aware of our policy when buying driving lessons. We are certified and licenced by the RMS in Driving Instruction of Motor Vehicles Class “C” for Manual and Automatic Vehicles. We hold Instructor Licence Numbers 13383/13387 issued by the RMS. We have undergone WWCC (Working With Children Checks) and are cleared to do Paid and Unpaid Work. Any person under the age of 18 years is regarded as a child. Medical examination as to their fitness. We have accreditation in TL141210 Certificate IV Transport and Logistics Road Driving Instruction. Our vehicles are fitted with Accelerator and Brake Pedals (auto) and accelerator, brake, clutch pedals (manual) which allow for better instruction of techniques. All our vehicles have fully comprehensive insurance and are 5 Star ANCAP Safety Rated fully registered and Engineered to comply with RMS requirements of Dual Control Fitted Vehicles used for Driving Instruction. We hold Public Indemnity Insurance and Public Liability Insurance which are separate to motor vehicle insurance. Our vehicles are clean, late model, smoke-free and air-conditioned. They are fully maintained by our Senior Instructor who is a qualified Motor Mechanic and Vehicle Inspector. All vehicles are checked prior to any lessons to ensure they are fully operational for the safety of the students and Instructors. Our Instructors treat students with respect and comply with OH&S Laws in regards to Discrimination, Harassment and we do not use offensive language. Instructors are not under the influence of alcohol, drugs or substances whilst instructing students and should be reported to us if you believe they are by using our complaints process. Any students who undertake driving lessons with Penrith Driving School cannot be under the influence of any alcohol, drugs or substances prior to commencing lessons or the lesson will be cancelled if determined they are not in any fit condition to drive a Motor Vehicle and a lesson fee may be charged. If you use regular medications that can affect your driving ability it is your responsibility to notify our instructors. Our Vehicles at Penrith Driving School are fitted with in-car cameras that record video and sound. We may use these for training purposes, legal purposes and insurance purposes should the need arise or an incident is reported. Penrith Driving School reserves the rights change or amend prices and website terms without any notice and will not be held liable for accidental or any unintentional errors in the information on this website. Users of this website should contact Penrith Driving School should they not understand the information contained on this website. Penrith Driving School will have the final say on any offers or lesson prices listed and as to whether we choose to undertake driving lessons or allow the use of our vehicles. The content and writings of this website remain the property of Penrith Driving School and are not to be reproduced or copied in part or its entirety without the permission of Penrith Driving School. We may provide links to other websites and use logos which remain the property of those websites and any links to that website or information they may contain may not be the views of Penrith Driving School. Choosing to select those links to another website is done at your own risk. By booking a driving lesson or lesson package through Penrith Driving School it is taken you have read and understood our website and that you acknowledge our terms, conditions, any agreements or any costs or information that we have available listed for your reference on our website when you undertake a booking with us or engage our instructors for a service we provide. You should contact us if there is any part that you do not understand or require clarification on. Except for any liability which cannot be excluded by law or which is caused by our negligence, our liability for any loss (whether direct or indirect), damage or liability whatsoever (including to a third party) which may be suffered in relation to the Lesson, is limited to the re-supply of the Lesson. All information provided by students to Penrith Driving School is confidential. We will not disclose any confidential information about students to third parties unless the law requires us to do so or permission is given. All personal information is kept in a secure location. Complaints should be directed to the proprietor on 0426 446 955 in the first instance or by email to penrithdrivingschool@gmail.com outlining the substance of the complaint and providing contact details and any other relevant information. Any complaint is taken seriously and will be addressed in a timely fashion and we will endeavour to resolve the complaint. Postal information is Penrith Driving School Po Box 43 Kingswood NSW 2747. Feedback is always welcomed and is always a gauge as to customer satisfaction. All comments will be reviewed in a positive fashion. We may choose to list those comments on our website from time to time about your experience with us and some comments may be summarised as to their content. We will list first name last initial only for privacy reasons. Should you not want your comments used on our website please inform us at the time of your email.